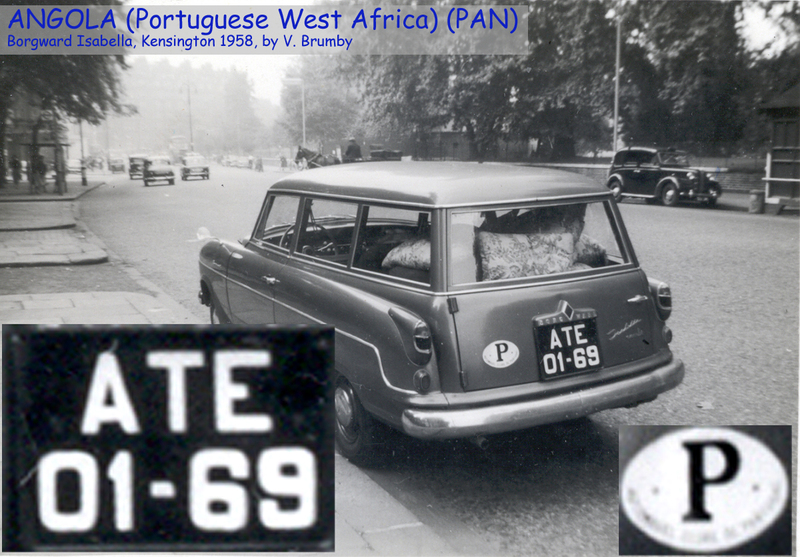 L-7234 shot by EU83 in the 1940s, when the international oval for Portuguese West Africa (Angola) was PAN – but that oval was never seen and cars bore the P oval when abroad. This American Nash owner had a separate alloy nameplate cast – great! This photo was originally almost illegible, but the clever manipulation of Antonio Barragan Lopez in Barcelona recovered this good picture. In about 1955 the system changed to AAA 12-34. A letter from the motoring association there in 1960 advised us that there were no regional codes – everything was licenced from the capital. 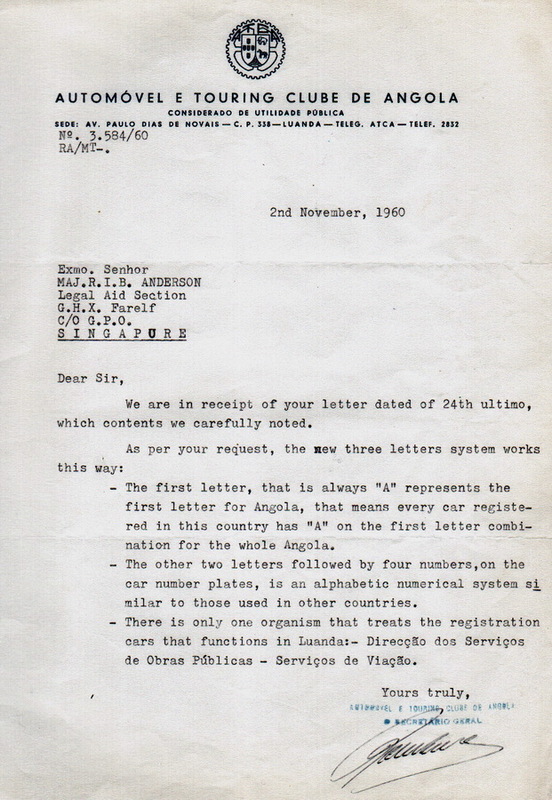 This correspondence with deceased member Roger Anderson advises ‘no regional codes – just alpha sequence. Note the reference to the ‘new’ series – we believe it had commenced 5 years before, in 1955! And so, between 1958 and 1978, we saw AAD (1976), AAK (’90), AAV (’64), ABA (’78), ACR (’64), ALA (’69), ALV (’58), ATE (’58), ANR (’64), AVM (’69). 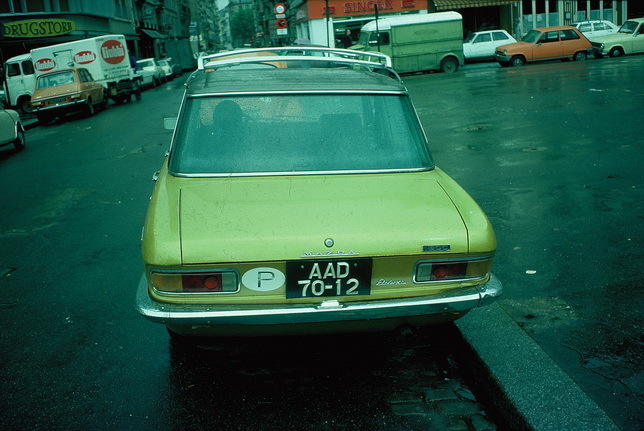 ATE 01-69 on a Borgward Isabella estate car in 1968 London. 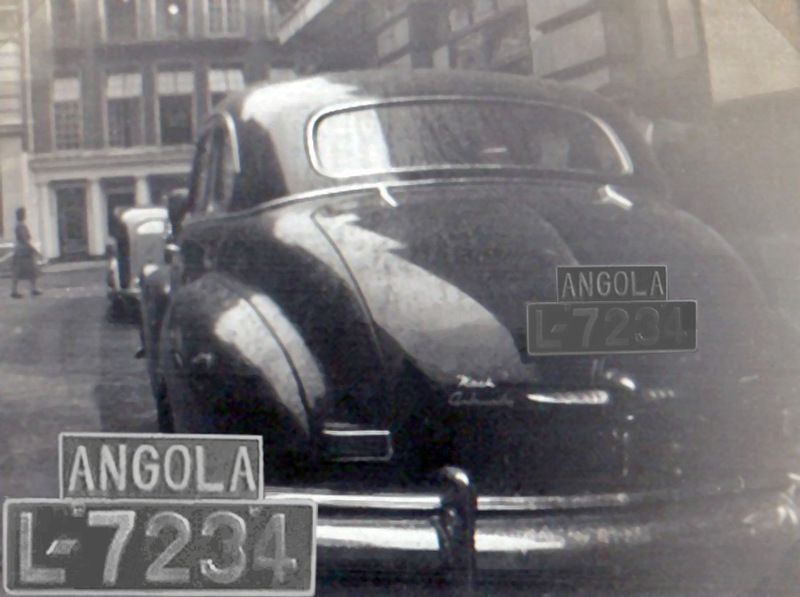 The question arises: How come, in only the 3 years from the 1955 series start, Angola issued alphabetically as far as ‘T’ – IF indeed, their plates were issued in serial order – AAA, AAB, AAC etc? Was the ATCA auto-club letter wrong? Or was it only referring to Luanda-registered vehicles? Brumby archive. 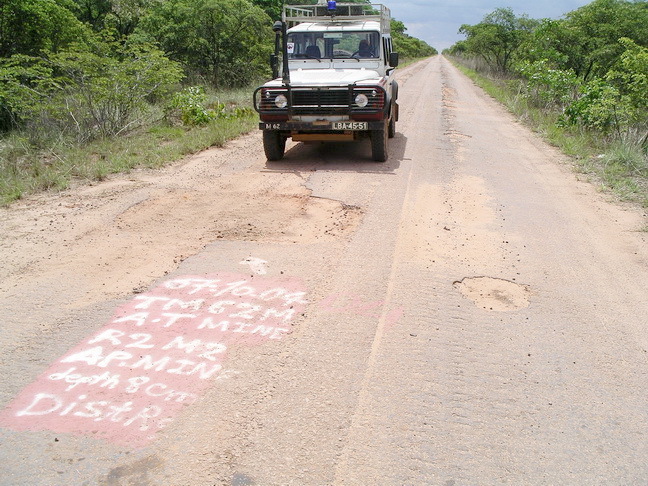 AVM and ATE: There are no city or county names in Angola which begin with T or V – so what might they be? 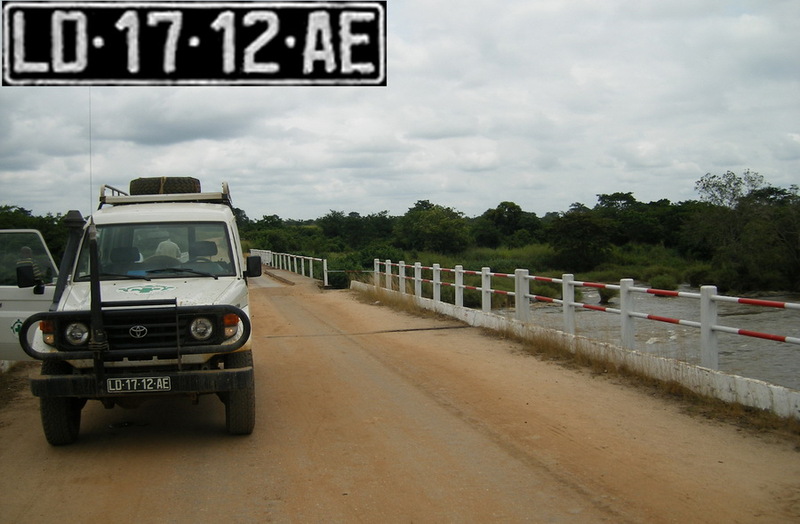 ATE – Cabinda has the local name of Tchiowa. Unlikely the Portuguese would have referred to that in a code. Eventually, peace reigned and motor registrations resumed, but now, the three-letter prefix was altered to use the two first letters to code new regional licencing offices, and one serial letter to follow. 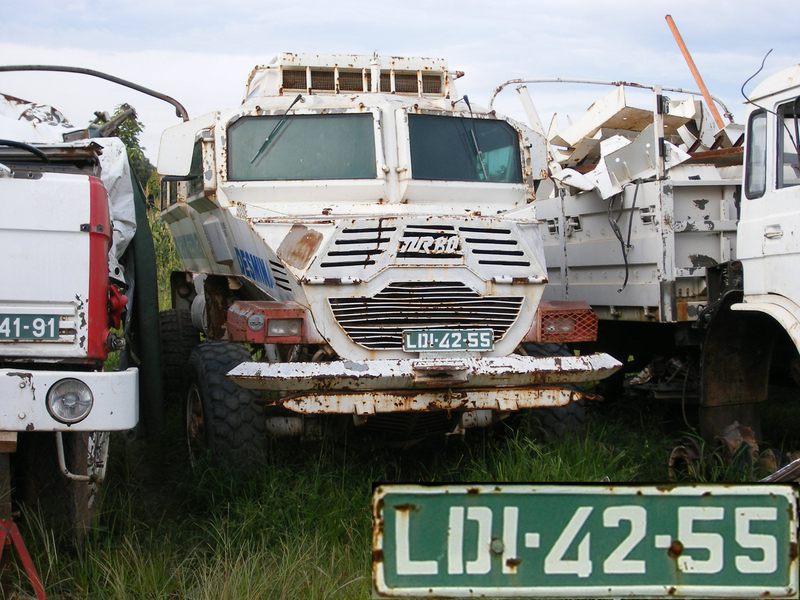 Many specialist vehicles were brought in from overseas to rebuild the ruined infrastructure, including the mine-clearance trucks built in South Africa, pictured below. 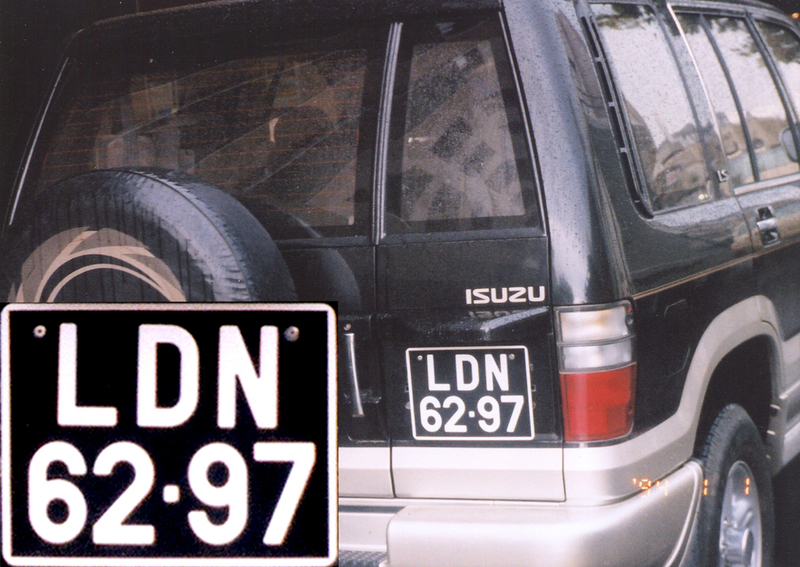 The green background shows that the lorry has been imported free of import duties, and if it is not re-exported, but sold locally when withdrawn from service, it would have to re-register with normal white on black plates. LBA-45-51 .. All in a days’ work for some brave international volunteers. and another Namibian-based sighting. KE=Cunene province. sees the current series introduced, using the new two-letter area codes from the 1996 series – and now with a two-letter series suffix. Here a duty-free and a duty-paid examples, both from the capital. So little is known about this benighted country and so few records are likely to have survived the decades of war that any slight information or images which readers might be able to add, would be a most valuable contribution. 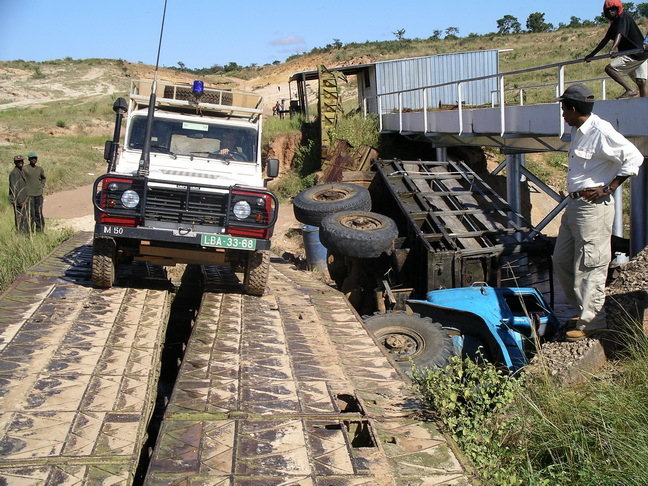 END OF ANGOLA – FOR NOW. This entry was posted on Tuesday, December 10th, 2013 at 1:54 am and is filed under Angola. You can follow any responses to this entry through the RSS 2.0 feed. You can leave a response, or trackback from your own site. That has got us guessing! No previous ‘N’ code seen – John Weeks thinks it could code Northern Province in an early code type. Thanks a lot for this unique photo, ‘thingsforsaleinbrittany’!! Let’s hope some more info follows from members or any other source.